So today is Labour Day here in Singapore. It’s suppose to be a day off for those working people. But of course, not everyone will get a day off. So most companies will just hold some buffet, like a reward, for their employees, just like my mom’s. And as for me, I am finally and officially on holiday! I guess we can all call it the summer break, because the heat waves in Singapore lately is just insane. It is not only bloody hot, and it ain’t raining. But that’s not gonna affect my mood to cook! 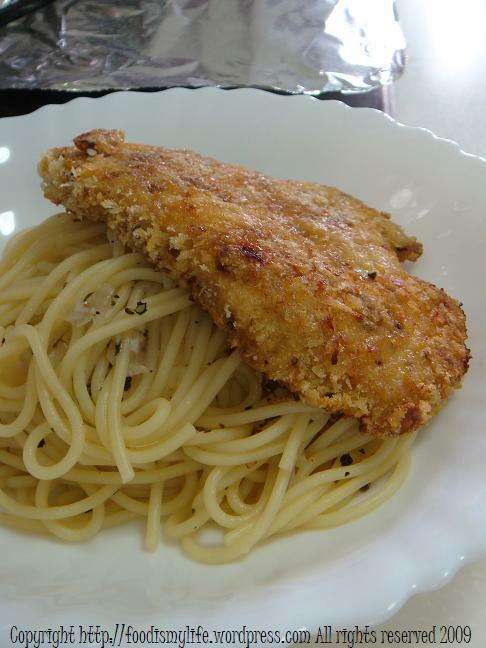 Since I am feeling to be healthy today, I whipped up a simple dish of baked chicken cutlet, and serve it with my spaghetti. X and I made it in hall a few days earlier. Since there’s no oven, we fried it in oil. It is sinful, I know. 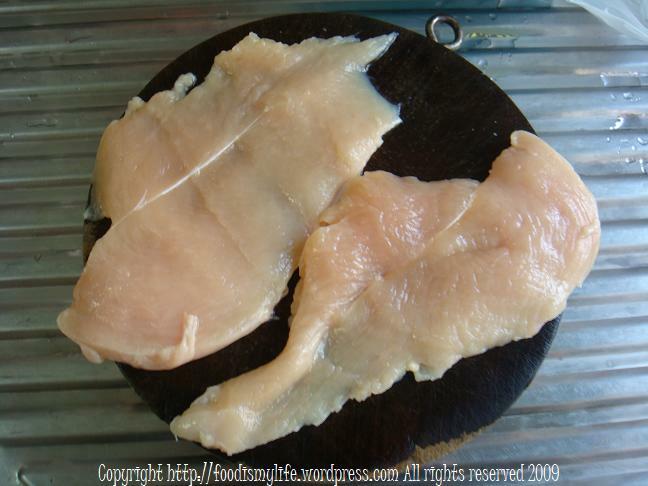 But it is definitely worth it because the chicken is tender and juicy, not dry like most chicken cutlets do out there. And the crisp of the chicken… oh… absolute yum. 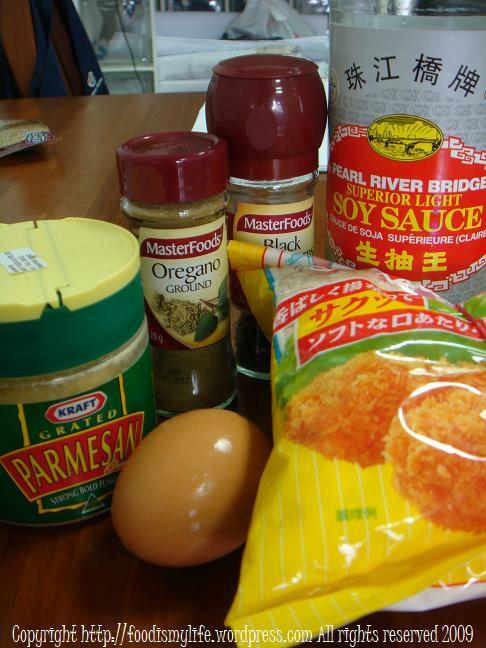 Before I start to make people hate me, here are the ingredients (in the order of their usage): chicken breast, soy sauce (or salt if you like), ground oregano (definitely optional), ground black pepper (I like mine fresh, but it’s definitely up to you), egg, grated parmesan and some bread crumbs. I absolutely love those Japanese breadcrumbs, aka panko (パン粉). They work like magic, truly and honestly. And you will never have to process your day-old bread for crumbs anymore. I am in a pretty good mood today, so I tried to take pictures as I prepare the chicken. And I have to admit: it’s definitely not easy. I can’t possibly grab my camera with those salted, peppered hands of mine, can I? So I have to keep washing and drying my hands before I can take a picture. Well I’m not exactly that patient. It will probably be more efficient if there’s someone to work with in the future. But, another time for that. So first, grab the chicken breast. Wash and pat dry. Mine are a little too thick, so I halved them. It’s not exactly perfect. But to me, life’s not about trying to be perfect. So let’s just move on. And after that, I tried to flatten them a little using the back of a knife. You can always sandwich the chicken in two pieces of paper and then bash with a rolling pin. But just bashing them with the back of a knife will simply save time – and resources. And then we season them. I first dipped them into soy sauce, then season both sides with oregano and plenty of black pepper. You can use salt if you want, but I prefer soy sauce. I feel that the chicken will be more evenly-salted. But whatever. And let them sit for 10 to 15 minutes before getting them ready for the bake. Beat the egg in a bowl. In a separate bowl, mix the breadcrumbs with the parmesan. If you’re daring, go for more cheese. And really, try the panko. It will be worth it. Then dipped the chicken into the egg, then into the breadcrumbs mixture. And boy, are they ready! Just bake them in the oven till they’re cooked through. Serve them warm with pasta, rice, or anything you like (the final picture’s in the end!). It’s a simple dish, and I considered it a really comforting food. And I feel less sinful while eating it, knowing that they are baked instead of fried. Obviously the flavour cannot be compared to fried ones… but well… life is never perfect, isn’t it? Preheat the oven to 190 degrees Celsius. Line a baking tray with aluminum foil and oil it. Place it in the oven for the oil to be heated up. Wash and dry the chicken breast. Halve it if it seems to thick. Then bash it by all means to flatten it so it will cook faster and more evenly. Season the chicken with soy sauce (or salt), oregano, and black pepper. Let it sit aside for 10 to 15 minutes. Beat the egg in a bowl. In a separate bowl, mix the breadcrumbs and the parmesan cheese. 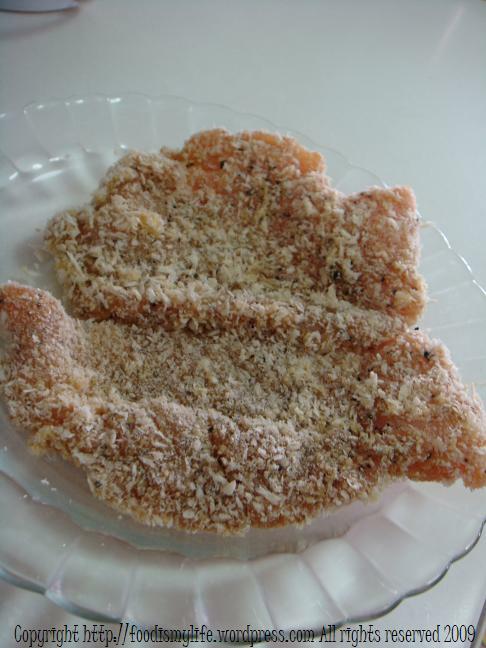 Dip the chicken breast into the beaten egg then into the breadcrumbs mixture, covering the chicken breast entirely with breadcrumbs. 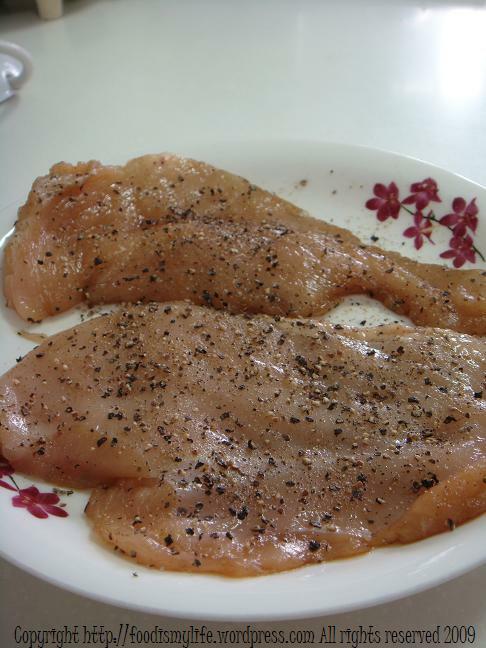 Bake it for 20 to 30 minutes, turning the chicken breasts halfway through the cooking. 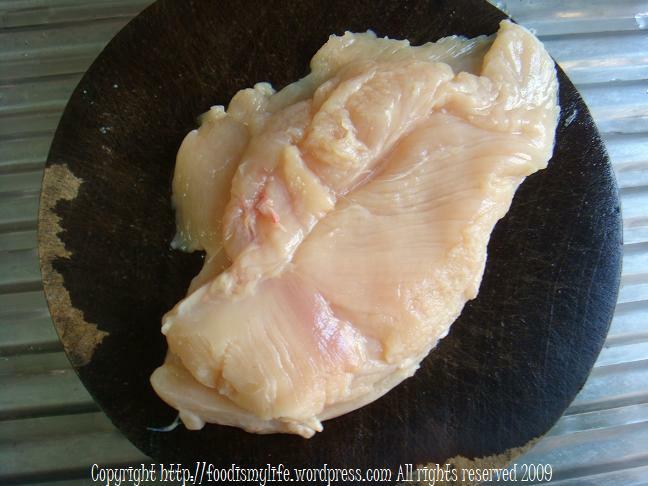 Bake until the surface is golden brown in colour and the chicken is fully cooked. Serve warm on curry rice or noodles. Or simply serve it with fries.